I have many tubes of oil paint that I never use. I don't remember why I bought them but mostly they just sit in my studio while I stick to a basic palette of primary colors in warm and cool plus a few other colors. 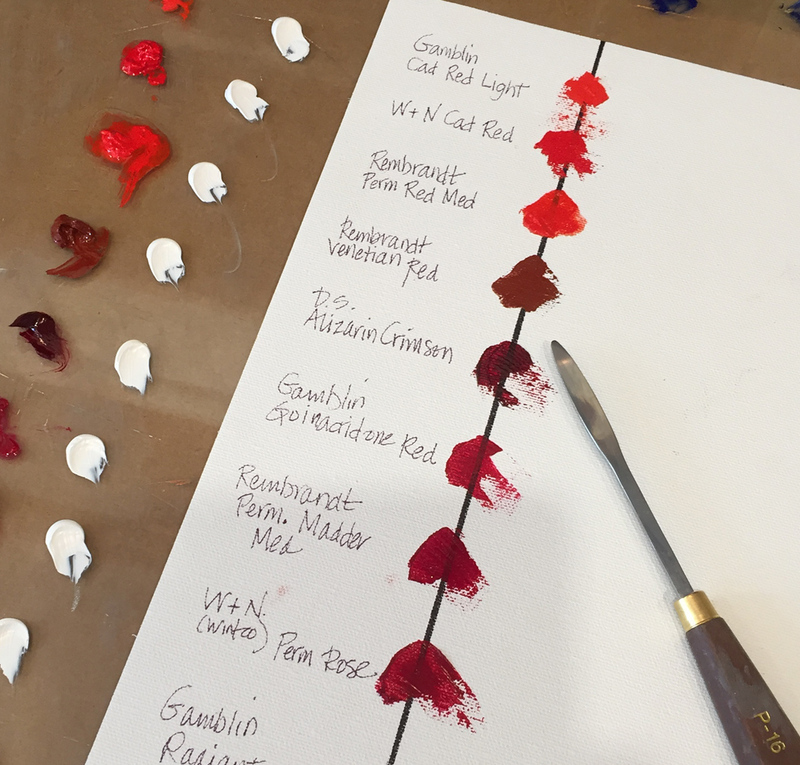 We're getting ready for two summer events here at the lake and I find it difficult to concentrate on painting while prepping for the next two weekends but it is a good time to FINALLY make color samples of all the oil paint I have. This was actually a lot of fun and I'm excited to get back to painting in August to use some of the beautiful colors I discovered. Reworking old paintings is one of my favorite things. At least once a year I go through my inventory and wipe off or paint over old paintings. 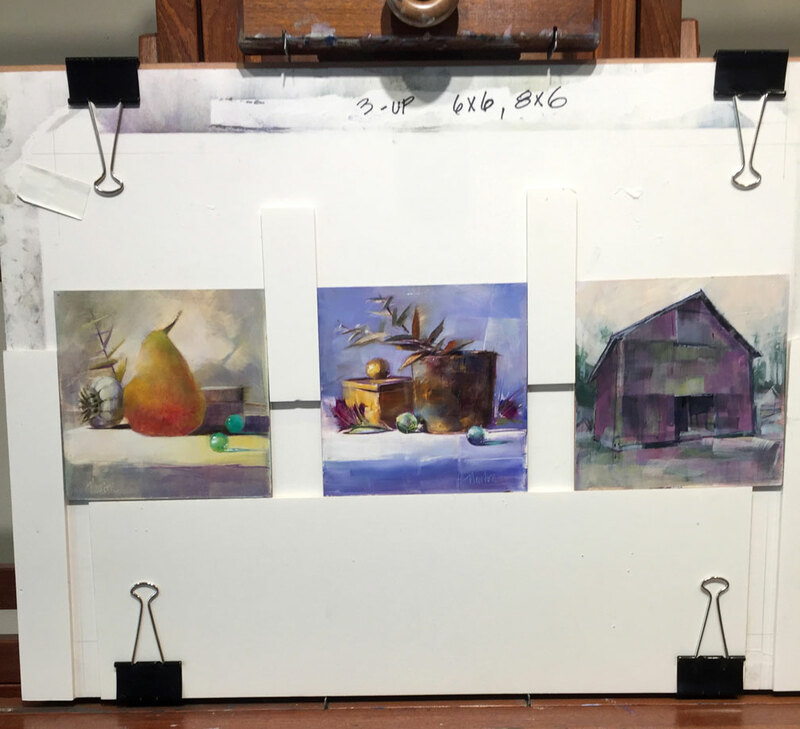 Today I unframed two from my oil Still Life series of 2014 and I found another Gessobord panel with the beginning of a barn. I cut and glued foam core to make a 3-up holder and visited the refrigerator for subjects. 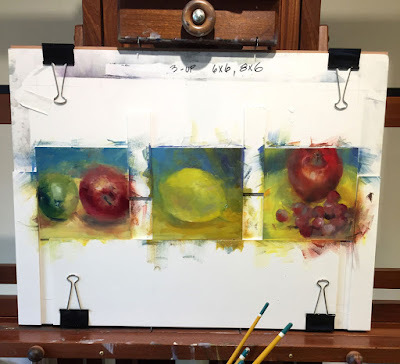 I started with the barn and began laying out where two apples on a plate might go. After I got them placed, I decided I didn't like the composition so I scraped the lower apple off and painted grapes instead. 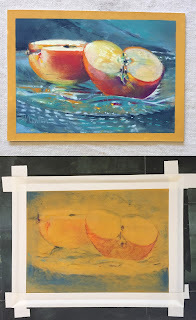 I spent a very fun few hours painting fruit. 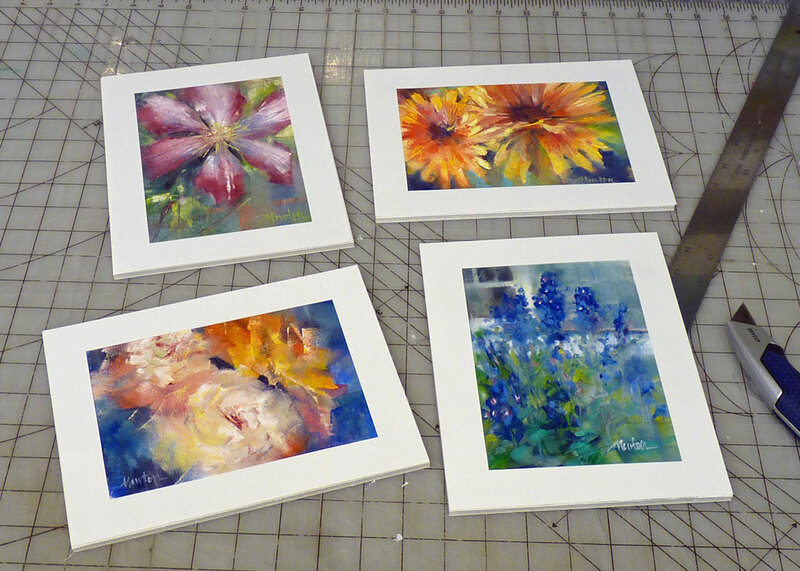 Each of these paintings is about 90% complete. I think I'll let them dry and continue on them next week. Did you know you can search my blog by label? Try searching for How to Pastel or How to Oil Paint. Click on the label then select Show All then go to Older Posts. This is a screen shot of the final four in my SUPER SUMMER SALE. Fourteen little oil studies over the past 6 weeks. 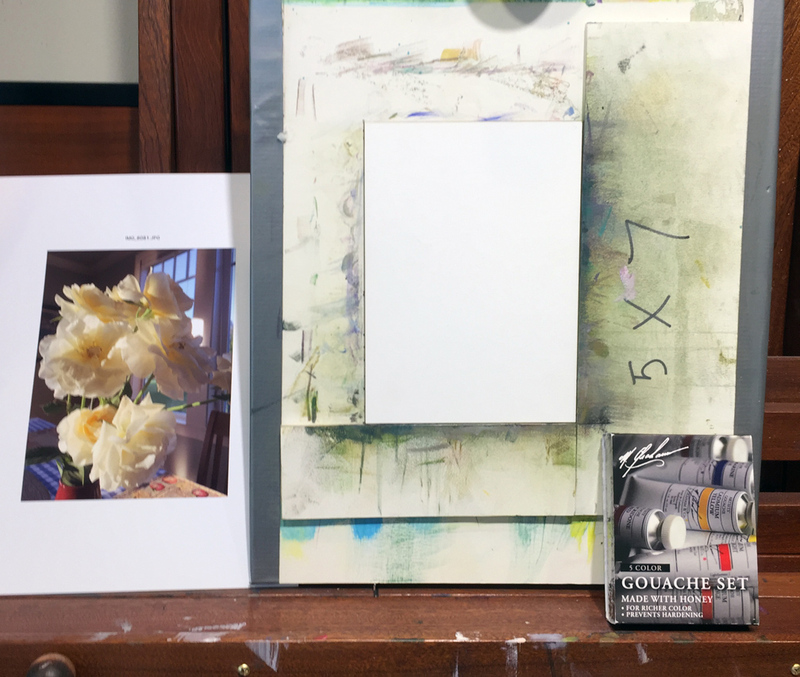 They gave me the experience of Fredrix canvas sheets, working plein air, reacquainting myself with my oil bar collection, and have generally cheered me each day. 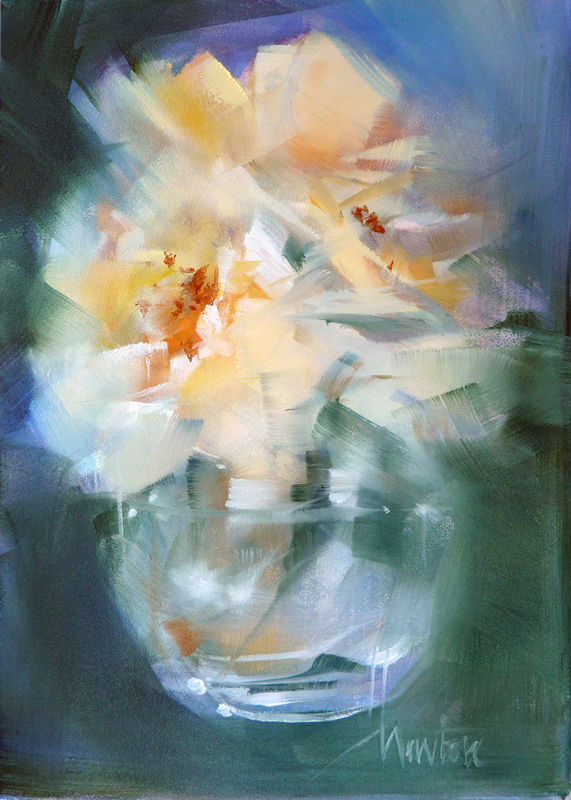 Many thanks to collectors, previous and new, for giving my studies a loving home. Yesterday, when I realized it was time to leave for my Friday painting group I wasn't prepared. It is easiest to paint in pastel at that location because my soft pastels are already inside my Soltek easel and my bag is pretty much packed. All I needed was a subject to paint and paper. 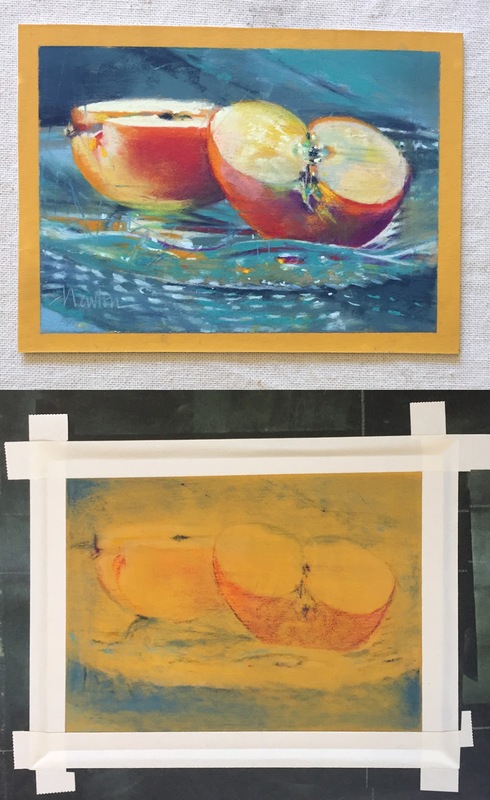 To the flat file for paper and the first thing I saw was the 5x7 apple painting done a couple years ago on ochre toned Wallis. Took it into the laundry room and washed the painting off. A quick dry with the hairdryer, taped it onto a Gatorbord and headed to the car. 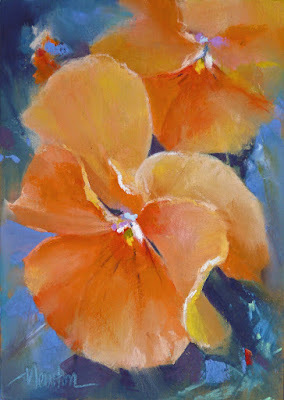 Gong to paint those orange pansies again, this time in pastel. Our summer lilies are in bloom. 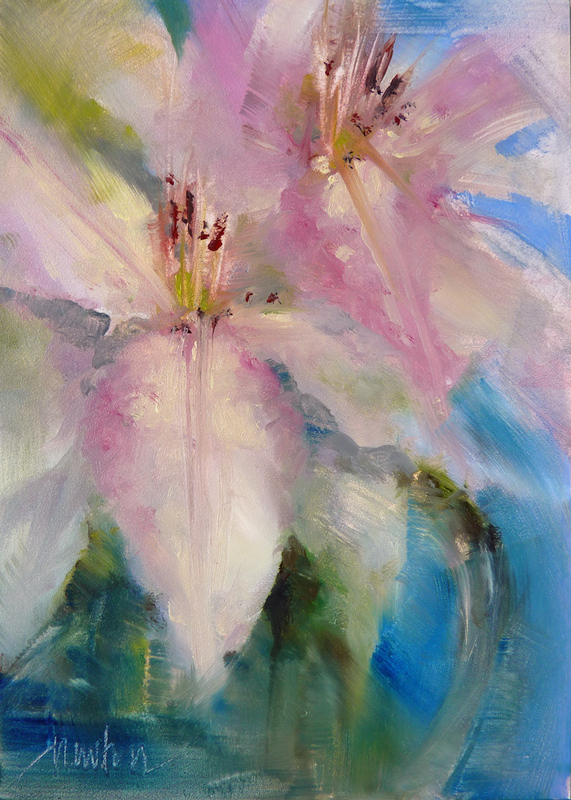 The four big pots of lilies by the garage are abundant and glorious but soon they will be faded and shattered. 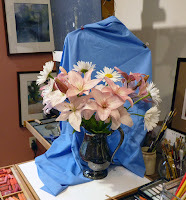 Thought I better paint them while I can.The angle changed as I stepped to the easel (not so much of the silver pitcher showing) but I am pleased with my impression of them. Now offering Private Art Lessons. July and August are full but I have one day left in September. Recently, I've been hearing the word gouache a lot. I remember the name from art school (more than 50 years ago) but I didn't really remember anything about the media. So when one of my private session students applied gouache as a foundation for her pastel pastel, it peaked my interest and I ordered a very limited set of M. Graham gouache colors to try. In every medium I seem to end up using the subtractive approach at some point. In colored pencil I lifted color away with resuseable adhesive and it became a trade mark technique for me. In watercolor I loved the look of lifting color. 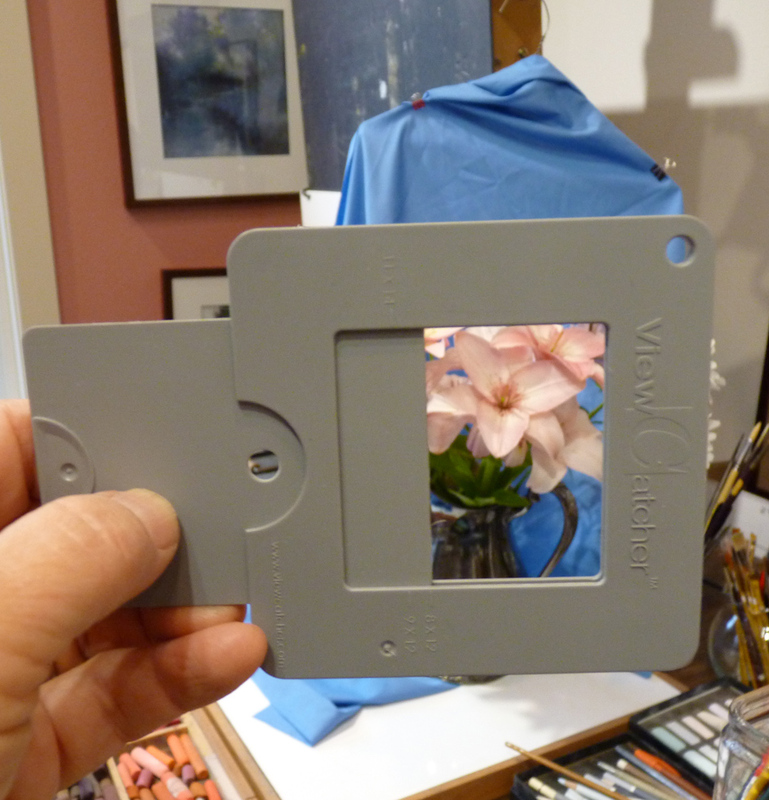 With pastel I went further and simply wiped off (or hosed off) entire paintings. Foundation work in oil often includes wiping away lights with a cotton cloth. 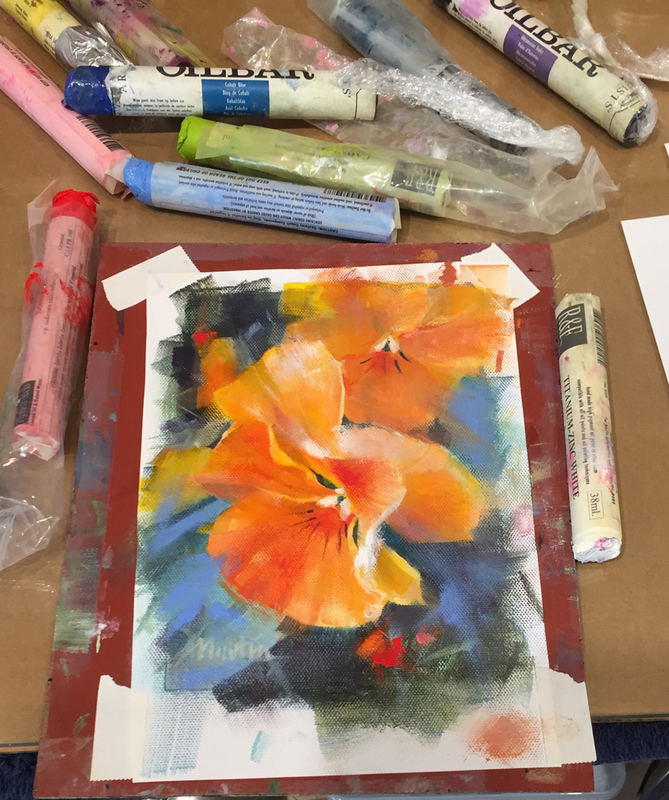 It is a practice that works for me; in fact, it may be necessary to my creative process. This is a detail shot of the gouache painting. LOVE the soft look it gives. With gouache I began the painting by glazing layers of thinned color and then wiping some away back to the bare Gessobord. I love the fragile, dusty look when gouache dries but I Googled gouache and learned that the beautiful dusty look is not good. It means I have added so much water that the medium is no longer stable. The other thing I learned is that paintings in this medium need to be protected by glass. When I read that, I thought I was at a dead-end because I'm trying to get away from framing with glass. It wasn't until the next day that it occurred to me that I could glaze oil paint over the gouache foundation and perhaps retain the delicate look of the gouache. And so, I began. First I glazed with transparent oils and a linseed/alkyd mix but then I got carried away and used whatever oil paint it took to get the look I was after. In the end, the primary role of the gouache was the inspiration it provided me. Now offering Private Art Sessions. July and August are full but I have two days available in September. A beautiful summer Sunday and a couple announcements. It's official, I'm teaching private lessons. 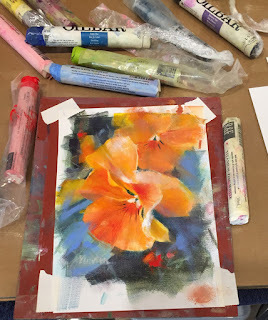 If you're interested, click on the PAINT WITH ME Workshops link in the Sidebar at right for more information. And, I'm finally getting back to auctions on eBay and posted three small pastels at special summer prices. 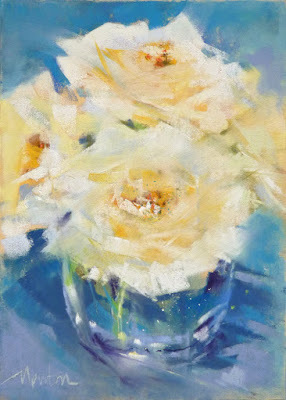 To see them, click on the My Paintings on eBay link also in the Sidebar. ...and hard to photograph. 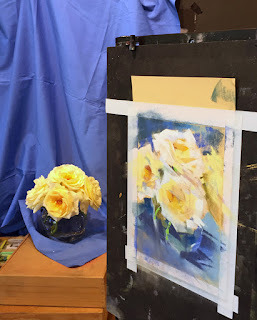 Buttery fragile roses given to me by Renee yesterday at our Friday painting group. She painted them yesterday and I painted them today. Thanks, Renee. It is difficult to photograph the nuances of very light colors. When the blues looked good, the light colors didn't. Not good when it takes longer to photograph a painting than to paint it. I'm finishing up the last of the Summer Sale on DailyPaintworks with oil bar and my fingers. Fun! My SUPER SUMMER SALE has been a fun project for early summer. 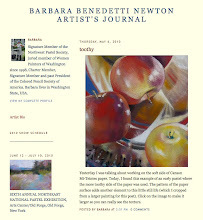 It motivated me to paint often, especially plein air. 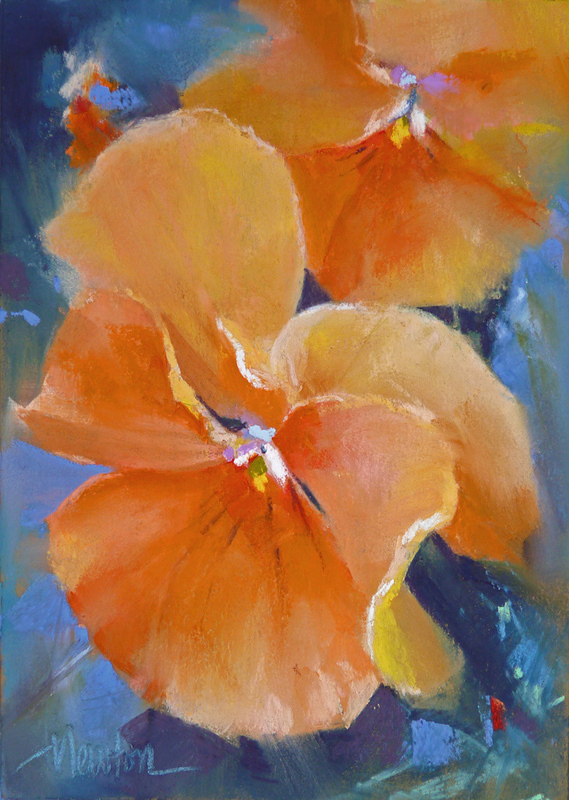 I have several more florals started and when they're complete, I will post them on DailyPaintworks as the final additions to the sale. Sale prices start at $25 with free shipping. Thanks to all who have given these little studies loving homes. 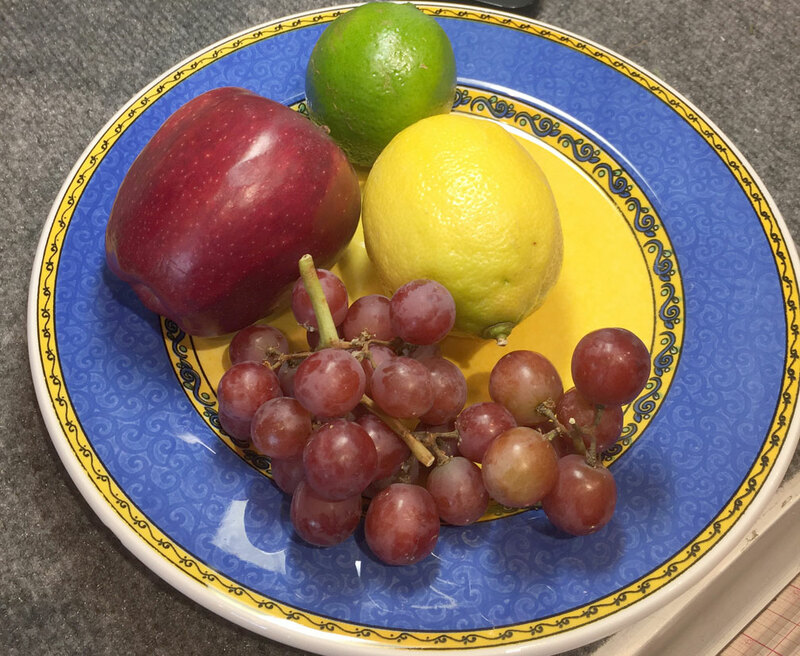 Wishing everyone a happy, healthy summer. 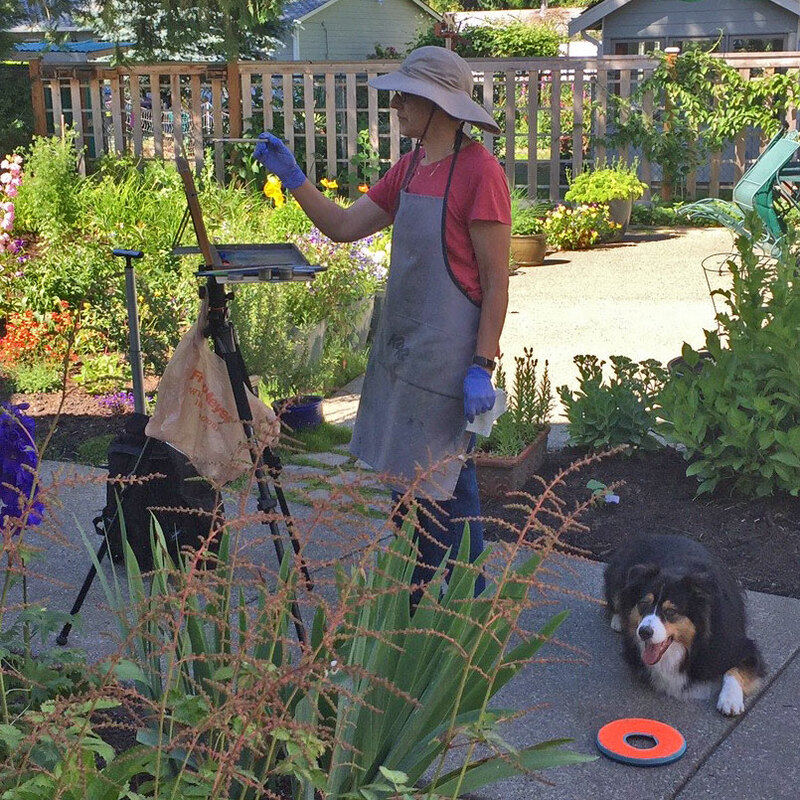 I've been painting plein air a lot this summer using my Open Box M mounted on a tripod. Every evening I close the lid but it isn't air-tight and the paint dries a little before morning. One of the artists who comes to my Studio for our Plein Air Painters of Washington Critique group gave me a tip (thank you, Bill): I now put my Open Box M in the freezer after each painting session. The next day it's ready to use - no thawing necessary. Some days I prefer painting in the Studio. I've have been using a French Mistress as a palette/color mixing but if I paint plein air several days in a row the studio paint on my French Mistress forms a skin or turns into hard, dry blobs. Today I may have discovered a better way. 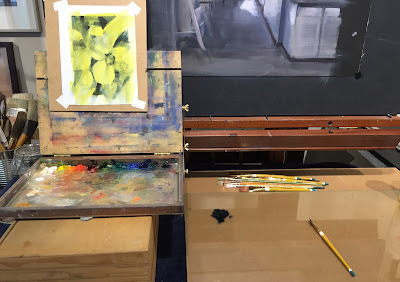 Instead of using the French Mistress, I now squeeze oil paint from the tubes into my Open Box M and then use it as my palette on the table in front of the easel in my Studio. I mix color on a 17 x 28 inch piece of glass. 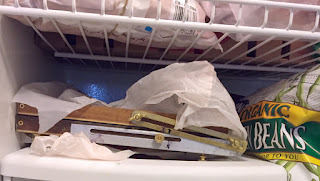 When I'm done for the day I clean the glass and the Open Box M goes back into the freezer and is ready the next morning for plein air OR for studio work. Because I’m using this “frozen” oil palette for both plein air and studio work, the paint gets totally replaced every couple days. 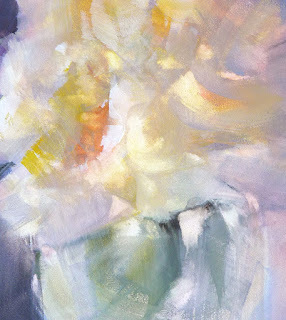 The painting of the flower is another for my SUPER SUMMER SALE on DailyPaintworks. 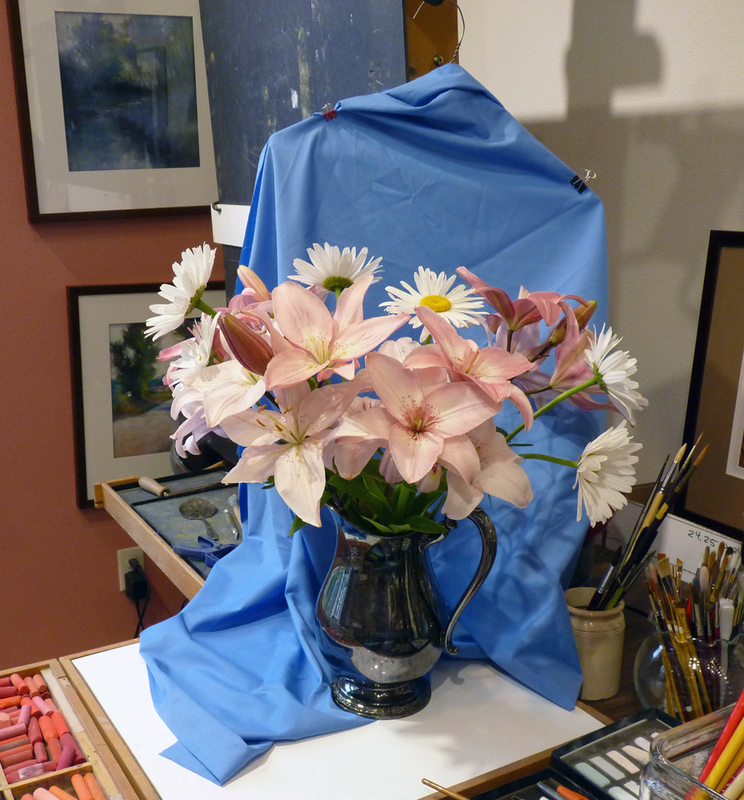 The painting in neutrals on the big easel is the first of a series of interior scenes, 18 x 18 inches. Eventually I'll have a new body of work to deliver to one of my galleries.